 HEAVY DUTY NON-STICK COOKWARE TO LAST FOR YEARS - Unlike Teflon or aluminum pots and pans that get dented or break, this tough heavy duty cast iron frying pan is is made from one piece of super strong cast iron. 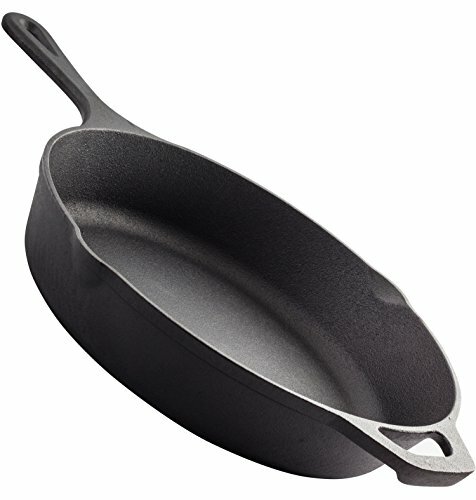 This super durable pan is also rust resistant and will remain in great condition even with a lot of use.  NON-STICK COOKING POT, USE LESS OIL - The pre-seasoned pan means that your cast iron skillet is completely nonstick! In fact, the anti-stick property of our cast iron cookware improves with age and frequent use, unlike that of chemical-coated cookware. The no sticky coating ensures you to add less unhealthy oils, seasoning and fats into your meals.  TWO HANDLES FOR SAFE AND EASY USE - The well-designed non-stick frying pan skillet is safe and easy to maneuver. With one long handle for moving the pan from one flame to another, and a shorter handle on the other side for easy pouring or transferring of food from pot to plate - great for restaurants, deli's and home cooking.  COOK, FRY AND SAUTE TO YOUR HEARTS DELIGHT - Cast iron pots are the most versatile piece of cookware you can own. Roasting, sautéing, grilling, broiling, shallow frying or deep-frying in plenty of oil. You can also use for poaching and boiling, or do as the Chinese do, and simply place a bamboo basket over the pan for steaming foods. If you have any questions about this product by Homerware, contact us by completing and submitting the form below. If you are looking for a specif part number, please include it with your message.